You would be hard pressed to find someone who hasn't heard of The Lord of the Rings trilogy. You would be hard pressed to find someone who hasn't heard of The Lord of the Rings trilogy. The movies themselves set a new standard for film making and went on to become international successes, even increasing tourism in New Zealand where the film was shot. The third film went on to sweep the Oscars, taking home 11 altogether. The books, written by J.R.R Tolkien, weren't the first ever to feature elves, dwarves, and epic battles, but they were presented in the most original way. Written in a prose similar to how the poem Beowulf was presented, they told a story of one man entrusted with the task of destroying an evil magical ring. With the help of a rag tag group of companions, he sets off on a journey that takes him to the strangest and darkest places he will ever see. That description is probably the most basic you could possibly ask for and for the sake of this review, we'll leave it at that. When the films came to DVD, each was given the royal treatment, hours of bonus material, outstanding video/audio presentations, and added footage edited into each film. Each was packaged in individual boxes, made up to look like a worn leather book that you would find within an ancient library. It's clear that director Peter Jackson had just as much love for these books as did the millions of fans out there. With the onslaught of Blu-ray, many epic film series have been transferred to format, sometimes with the addition of new bonus material. So it isn't a surprise to see that the Lord of the Rings trilogy is getting the same treatment. Available now, the films, already outstanding to watch on your home screen, look even better thru Blu-ray. The bonus features are the same that came with the extended editions, not that it really makes too much of a difference because they are still fun to watch (Also included this time around are UltraViolet copies of each film). It's fun to see films we love get treated so well, especially when those films were quite the box office success. One can't deny the obvious marketing scheme behind all this, given the new Hobbit film coming to theaters in December. Regardless of how planned out all this was, it doesn't make the experience any less sweet. There are many fans who are waiting with anticipation for the release of The Hobbit: An Unexpected Journey (this critic included) and while December can't get here fast enough, at least we have this to hold us over. 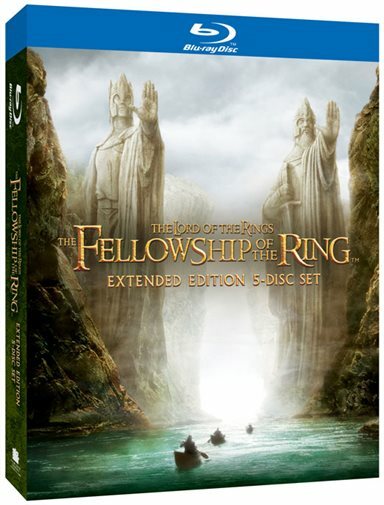 Download The Lord of the Rings Extended Edition 5-Disc Set from the iTunes Store in Digial HD. For more information about The Lord of The Rings: Fellowship of The Ring visit the FlickDirect Movie Database.